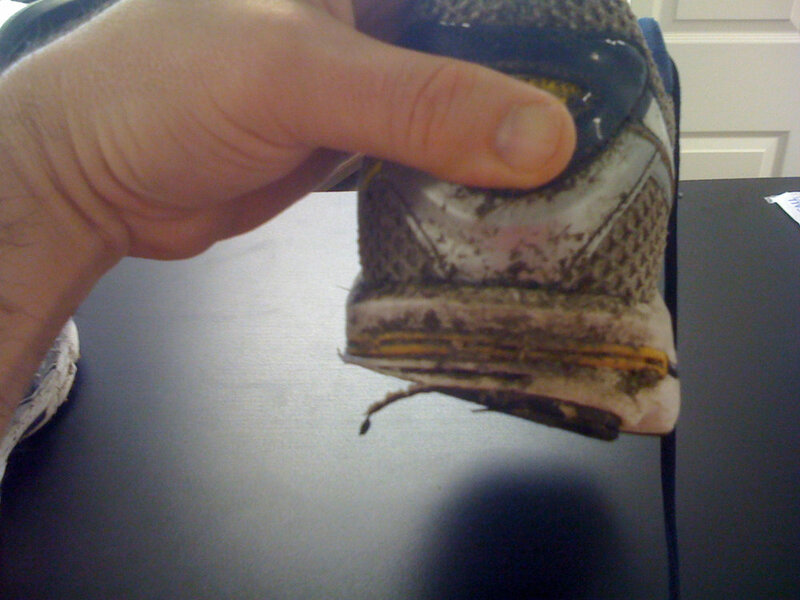 Can you believe that an experienced runner would let a pair of shoes get this far on both sides. This person does a few marathons a year and has been a patient of our for years…..he tends to milk out every last step in a pair of shoes but we had to hog-tie him and flog him repeatedly for going overboard this time. I bet there had to be 2000 miles on these puppies ! And get this…..he had no foot or knee pain ! (his response was, i saw the wear but i was not having any issues). Can you imagine how far out side the contact line the knees had to be ? This has the old Nike Cesium beat by a long shot (they were rear foot posted varus by about 3degrees). Heck, this could be 20-25degrees varus ! There is no question that he is avoiding and rear or mid foot pronation……the dude is fixed in supination. OF clinical note, he has a fixed right hallux limtus (turf toe) so this likely helps him to avoid medial toe off and forcing dorsiflexion through the big toe joint……however, there are better strategies than this to avoid a hearty toe off ! It is amazing what the body can endure ! Take this as a lesson of what NOT TO DO ! keep the miles between 400-500 miles gang……there are only so many compression cycles in EVA foam before deformation occurs. In this case there was both deformation and just pure and simple friction wear ! PS: this was an easy pick up clinically……he sat in the waiting room with the 55 gallon barrel set beside him ….the one that he had been carrying around between his knees to force this much rear foot varus !